Good morning, dear friends! Hey, don’t leave the page! I know, I know, you saw the title of the post and all of a sudden you frowned, right? Well, I ve got news for you! Broccoli can be pretty awesome! I have been a broccoli/cauliflower fan ever since I was a kid! I am not kidding! And it seems my baby boy likes all veggies just like his mom. Even if he is only 11 months old he has already tried all kind of veggies, even stuff that I tried a few years ago such as fennel, celeriac, butternut squash etc. Well this is the destiny of a vegetarian food blogger’s kid! This salad is simple and delicious. Made with few ingredients in a few minutes it is beautiful and nutritious. Raisins, dill, roasted sesame seeds and flaked almonds boost the flavour of the salad and transfrom it into a delicious dish! Do try it! Happy weekend everyone! In a bowl combine the olive oil with the vinegar. Add the garlic powder, salt, pepper. In a non sticking pan roast sesame seeds and almond flakes until golden brown. 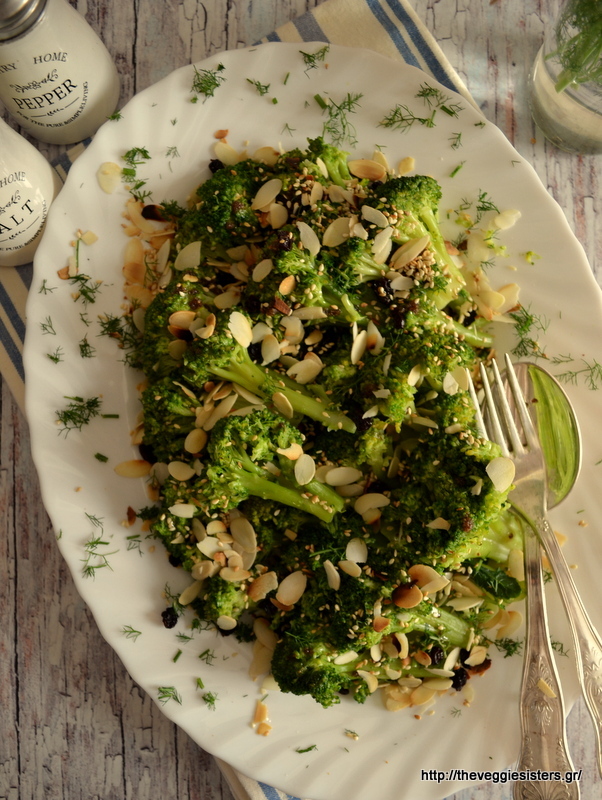 Pour the sauce over the drained broccoli, top with sesame seeds, almonds, raisins and dill. Serve on a platter. Enjoy! Share the post "Broccoli salad"